Quick overview The Man Booker Prize-longlisted follow-up to the multimillion-copy bestselling ONE DAY. 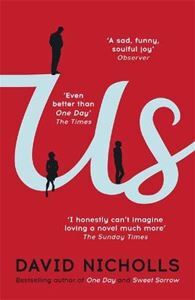 David Nicholls brings to bear all the wit and intelligence that graced ONE DAY in this brilliant, bittersweet novel about love and family, husbands and wives, parents and children. Longlisted for the Man Booker Prize for Fiction 2014. Douglas Petersen understands his wife's need to 'rediscover herself' now that their son is leaving home. He just thought they'd be doing their rediscovering together. So when Connie announces that she will be leaving, too, he resolves to make their last family holiday into the trip of a lifetime: one that will draw the three of them closer, and win the respect of his son. One that will make Connie fall in love with him all over again. The hotels are booked, the tickets bought, the itinerary planned and printed. What could possibly go wrong?